Leftover rice has many uses besides just feeding the birds who come at my windowsill in the kitchen every now and then and then fight each other for the grains. 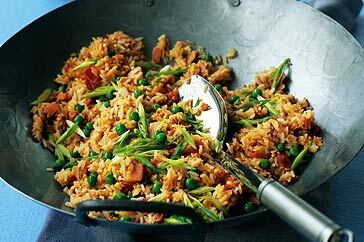 Generally if I have rice leftover I use it again the next day with a bit of a different twist. All you will need is rice for this recipe and basic ingredients which are usually lying in the fridge or larder and you can serve up some yummy stir-fried rice. In a wok, add about a teaspoon of cooking fat and when hot, add the onions. saute lightly then add al the vegetables of choice and stir fry lightly. Add the rice, mix well, then add the soy sauce and other seasoning to taste. If you are adding things like tuna fish, sausages or ham, you can do this right at the end as the meats are cooked and just need a quick stir into the rice. Feel free to experiment with any other left over ingredients into the rice and go crazy with the veggies.